Amiya,Memorial Creative Arts, Asansol (Director- Kalptaru Guha), Thakur Nagar Mime Academy of Culture, Thakur Nagar (Director-Chandrakant Sirali) showcased their talent.Assam was represented by Third Theatre,( Director- Bijit Kumar Das), Mime and Skit Theatre, Assam( Director-Kuldeep Patagiri) and Minangka Deka and group. “The Mimers”, Kerala (Director- S. Sreekumar), Akriti Rang Sansthan, Bihar(Director- Sunil Phekania) Kanglei Mime Theatre Repertory, Imphal, Manipur (Director Dr. Y. Sadanand Singh) , had group performances while Chittaranjan Satpathy form Bhubaneshwar, Odisha, Asif Sher Ali Khan of Do Qadam, Jaipur, (Rajsathan), Siraj Ahmed Bhati and Priyanka Chandani of Rainbow Society, Jaipur (Rajasthan) had solo performances. I was fortunate enough to represent Martand Foundation,Udaipur, Rajasthan and perform solo Mime “ Kripan” based on poem from Geetanjali, Padmashri Niranjan Goswami, Director of Indian Mime Theatre Kolkata and the personality behind India International Mime Festival welcomed and honored all the artists from India and Abroad. This festival had had Morning Workshops, Face to Face Interaction Sessions, Seminars relating to Mime Art in addition evening stage performances. The Festival started with a Shobha Yatra (Carnival) showcasing 300 artistes, Mimes, Puppeteers, Dragon dancers,Ranapa dancers, Drummer, Acrobats,Musicians, Behrupiyas, Magicians and individual performers. The festival was inaugurated with lighting of Lamp by all the Directors of groups and individual artistes attending this Festival. All the performances were of high quality and ensured bright future of this Art. 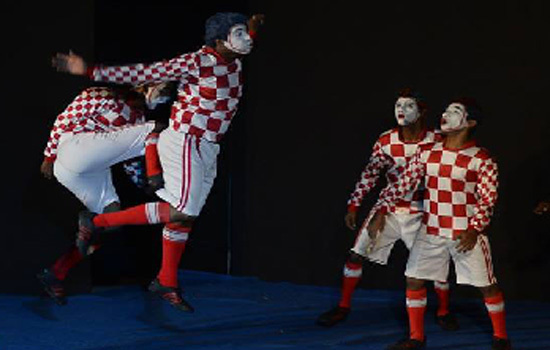 Many young Mime performers and students were benefited by the rich experiences of the stalwarts and seniors. 70 years old artist from Germany Nemo is the First Official Ambassador of World Mime Organization told that recently the WMO created World Mime Day on 22nd March. Padmashri Niranjan Goswami told that this first ever IIMF will go a long way to create concern and honor about this art globally.